1 OWNER VEHICLE, CLEAN CARFAX, BACK UP CAMERA, BLUETOOTH, VOICE COMMAND, MP3/CD PLAYER Gray Cloth. CARFAX One-Owner. Clean CARFAX. 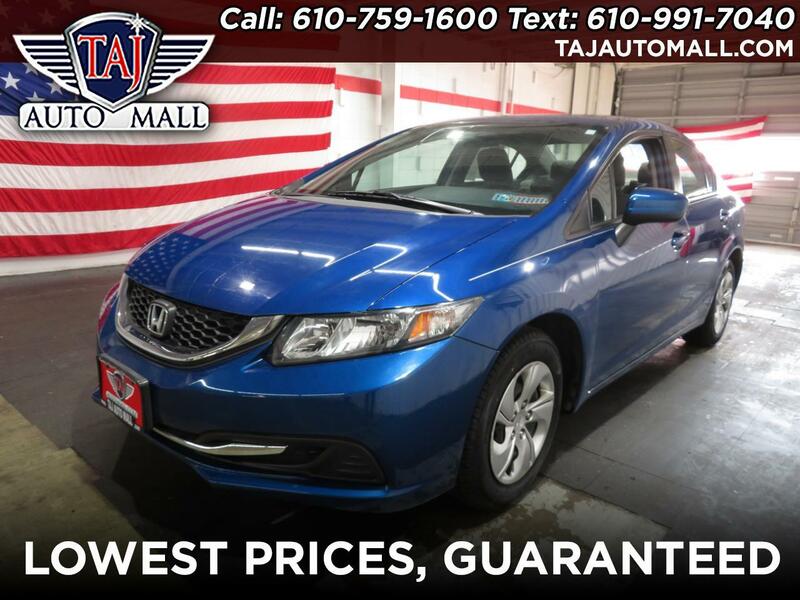 Blue 2014 Honda Civic LX FWD 1.8L I4 SOHC 16V i-VTEC Recent Arrival! 30/39 City/Highway MPG Awards: * 2014 IIHS Top Safety Pick+ * 2014 KBB.com Brand Image Awards 2016 Kelley Blue Book Brand Image Awards are based on the Brand Watch(tm) study from Kelley Blue Book Market Intelligence. Award calculated among non-luxury shoppers. For more information, visit www.kbb.com. Kelley Blue Book is a registered trademark of Kelley Blue Book Co., Inc. Reviews: * With its reputation for reliability, safety, comfort and excellent resale still intact, the 2014 Honda Civic remains one of the best small-car values around. Be it the standard sedan, sporty coupe, racy Si trim, frugal hybrid or ultra-clean CNG model, there is a Civic to meet almost any demand. Source: KBB.com * Redesigned for 2014 the Honda Civic is back to rest the critics of the past. Whichever Civic you choose, you'll find the technology and refinement to make the journey more exciting than the destination. A new front grille and headlights adorn the front end, while new taillights help you stand out from behind. Add to that its wheel options and you've got the sleekest Civic yet. The 1.8L, single overhead camshaft, aluminum-alloy i-VTEC 4-cylinder engine uses state of the art engineering technology to produce an impressive 143hp, yet it still receives excellent fuel-efficiency ratings and a Partial Zero-Emission Vehicle rating, all on regular gasoline. Honda's new Earth Dreams continuously variable transmission (CVT) provides an outstanding driving experience. The CVT allows the engine to always operate at the most efficient rpm level, enabling maximum efficiency under all driving conditions. Interior features include an impressive array of available tech features including an available 7-inch display audio with a touch-screen interface; the Honda LaneWatch system which activates a tiny camera on the passenger side mirror when you signal to change lanes to cover more view than the passenger-side mirror; HondaLink's Aha app allows you to access news, social media, restaurant searches, internet radio, and more; a rearview camera is available with up to 3 available angles to view; Satellite navigation is also available with voice recognition software. The Civic's Advanced Compatibility Engineering II body structure is a Honda-exclusive body design that enhances occupant protection and crash compatibility in frontal collisions. The ACE design utilizes a network of connected structural elements to distribute crash energy more evenly throughout the front of the vehicle. This enhanced frontal crash-energy management helps to reduce the forces transferred to the passenger compartment and can help to more evenly disperse the forces transferred to other vehicles in a crash. Source: The Manufacturer Summary Taj Auto Mall has over 1,500 affordable vehicles in stock. Our dealership specializes in providing you with the best used cars, trucks, and SUVs in the Allentown, Pennsylvania area. Part of our promise to you is that we will always strive to provide you with unbeatable service. Our goal is to go above and beyond your expectations. Our Bethlehem dealership has tons of well-equipped SUVs, trucks, and cars at highly affordable prices. Recent Arrival! So come on down to our dealership in Bethlehem, Pennsylvania. We are open Monday through Saturday from 9 am to 8 pm. Contact us with any used car questions you may have, our number is 610-759-1600. Make Taj Auto Mall your first choice for affordable used vehicles.